I heard the sad news that the man in this story passed away this morning. I’m remembering him today just as he shared a sweet memory of his own mom and I’m praying for his family…. Years ago, the sweet man who led our church choir leaned back in his stool at the front of the music room. He told us in a slow southern drawl what he remembered about his mother. On the dark and stormy nights of his childhood, when the thunder raged and lightning struck close enough to illuminate his room, he would awaken to find his mom sitting in a chair at the foot of his bed. She sat with him through the storms, praying over him, even while he continued to sleep. That’s what he remembered about her: her presence in the stormy nights. Last night, I supervised the brushing of teeth and the donning of pajamas, packing lunches and backpacks, and laying out clothes for the new day. We read bedtime stories. We prayed as a family. This morning, I poured cereal and I buttered toast. I placed ice packs in the lunches and zipped up the backpacks. I helped with shoes and socks, combed hair, and reminded my daughters (too many times) to brush their teeth and to do it well because they don’t want cavities or bad breath and, by the way, we’re going to the dentist next week. I checked the weather and then I held out jackets for each girl. I broke up a fight and gave a crying daughter a hug, calmed her down, and then placed the two sisters on a school bus. The day was like every day. I don’t remember these childhood moments, not my mom tying my shoes or helping me put on my jacket, supervising bath time or pulling my hair into pigtails. But she did them. My life is filled with years and years of everyday acts of love I don’t remember. Usually these acts of love remain unnoticed and undervalued . . . unless they’re missing. Those children who aren’t fed well, bathed, read to, hugged, kept safe, and tucked into their own cozy beds at night feel the lack. What will my kids remember about this time with me? It’s not likely they’ll remember the moments of jackets and breakfasts and backpacks. But they might remember the special times, like waking on a stormy night to see mom by the bed. And I wonder, what do I remember about God, my Father? Usually, it’s the stormy times when I awaken in fear only to find His presence. It’s the times He’s kept me safe and delivered me from danger. Yet, we so often overlook the miracles of everyday grace, the simplest signs of His affection and the fact that He cares for our needs and yes, sometimes even our desires. When we always look for the glorious miracle, the immediate and the extraordinary, we miss thanking God for the gradual, the expected, and the small. We revel in the answers to prayer that come fast. The ones that don’t require interminable waiting and inconvenient patience. We pray, “Give us this day our daily bread” and then miss the miracle of everyday provision. When all our enemies heard about this, all the surrounding nations were afraid and lost their self-confidence, because they realized that this work had been done with the help of our God (Nehemiah 6:16). 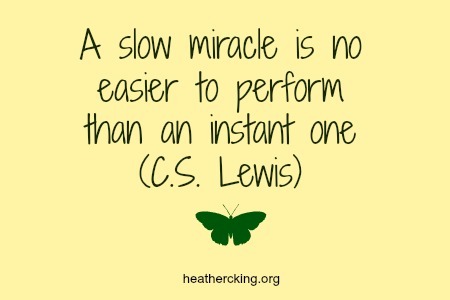 How easy it would be to overlook the miracle, though, because it didn’t look miraculous. “It’s worth noting that so far we’ve read nothing of angels, burning bushes, or talking donkeys. Instead, we’ve seen God use what we might consider ordinary to bring about extraordinary transformation: prayer, repentance, willingness, hard work, sacrifice, humility, faith. Though miraculous displays of God’s power are to be desired and cherished, I’m equally impressed with God speaking silently to Nehemiah’s heart in the most ‘normal’ of circumstances. Be encouraged that the common, everyday realities are ideal environments for God to put something in our hearts to do” (Minter 116). So we thank Him for the daily bread, for forgiveness, for mercies made new every morning, for unceasing faithfulness, and His goodness (Lamentations 3:23-26). We thank Him for the quiet and the everyday and His presence. It may not be showy and ostentatious. Still, it’s love. That’s worth remembering. Thank you for this wonderful message.